Apple has supplemented its Apple Watch range by introducing a dedicated accessory that should make charging the intelligent timepiece not only a lot easier, but a lot more aesthetically pleasing. Those who follow the industry will have more than likely already been aware that a product of this nature was imminent after a set of leaked images of the product surfaced online yesterday. 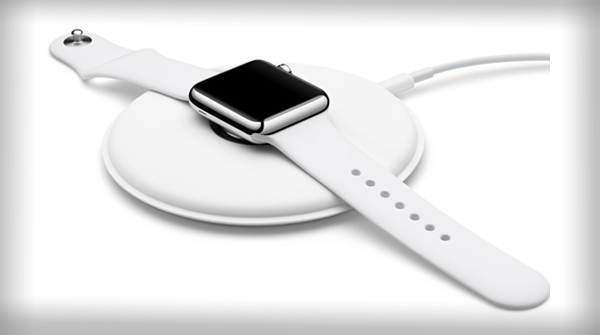 However, the Apple Watch Magnetic Charging Dock is now an official product available to purchase directly from Apple. As you might expect, the official Apple designed and developed product falls under the seamless and beautiful category. 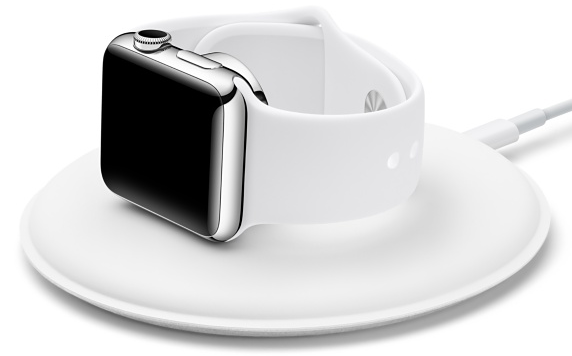 The overview of the accessory suggests that owners are able to charge the Apple Watch in a flat position with the band open, or with it lying flat on its side. If the latter is chosen, then the Apple Watch is automatically put into Nightstand mode when connected to the magnetic docking charger. This is to allow it to be used as an alarm clock while also receiving a charge. Apple is also keen to use the official website blurb to let potential consumers know that the cylindrical hardware uses the same inductive charging connector that is supplied with a purchase of the Apple Watch, and that it is fully compatible with both the 38mm and 42mm Watch models. 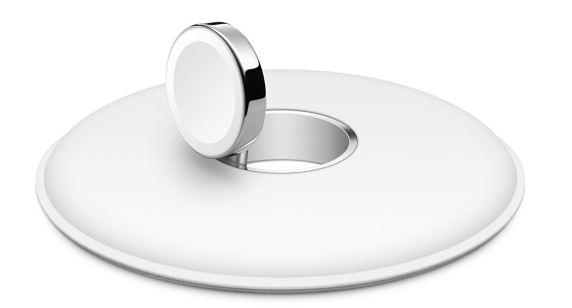 Those making the decision to purchase the new Apple Watch Magnetic Charging Dock can expect to part with $79.00, and will receive a flat white disc styled product that connects via a Lightning cable to a power outlet. There’s also a 2m Lightning to USB cable provided in the package. The release of the Apple Watch Magnetic Charging Dock outlines Apple’s continued commitment to supporting and developing accompanying products that exist to complement its intelligent and highly personal timepiece. Apple has specified via the website that those purchasing the device today can expect shipping to start on November 20. Those who prefer to do their shopping in an actual physical retail outlet will be able to do so directly from Apple when stores start receiving stock of the product on the same day. Will this be the first of many new Apple Watch related accessory products that we will see coming to market directly from Apple? exactly…. piece of junk iDeadBattery meets iWaste. That’s pretty expensive. There are more elegant looking solutions on the market from 3rd party manufacturers for that same price or cheaper.